Throughout the Easter season, we have been reading from the Acts of the Apostles, Luke’s sequel which tells the story of the early Christian community. Today, we return to its opening verses. Acts 1:1-14 serves to link the Gospel of Luke and this new account. As with all good transitions, these verses look back and then forward. They look back by addressing Theophilus, the addressee of the Gospel as well, and by reminding Theophilus of the broad strokes of the story. Then as Jesus gathers His disciples, He looks forward by prophesying of their mission to all the world. Then, just as the Gospel ended with the Ascent of the Lord, Acts begins the story of the Church with the ascent of the Lord. Our verses today finish out the introduction. 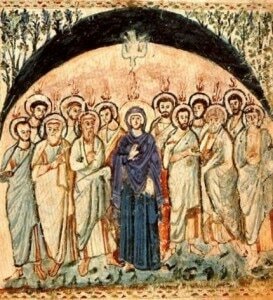 We are told that the Apostles return to the upper room with Mary and other women. Notice that they return to a place of intimate connection with the Lord. Notice also that they devote themselves to prayer. Throughout Luke-Acts, prayer is an important motif - major events and moments are marked by prayer. Jesus gives example by praying. And now in Acts prayer is the principle means of connection to the Lord. The second reading continues our reading from First Peter, a letter addressed to Christians of a later generation who struggled to maintain the faith in the face of opposition, persecution, and temptation. Here the author counsels them against losing heart in their sufferings. Not all suffering has meaning, but suffering for what is right gives glory to God. We do well to remember that Jesus met terrible and deadly opposition not for doing wrong but for healing the sick, for forgiving sins, for preaching the liberating truth of God’s loving mercy. Too often, doing good or speaking the truth invites resentment and anger. In those moments, First Peter would have us remember the example of the Lord and know that our suffering for the right is a suffering with Him who suffered for our redemption. The Gospel passage from John brings us to the end of Jesus’ long farewell address to His disciples. Here in Chapter Seventeen, Jesus caps the address with a prayer addressed to the Father but spoken in the hearing of the disciples. He begins by speaking of the hour of His glory. Following this prayer, the action will move to the garden and the beginning of the Passion. This is the hour prophesied in the Gospel in which Jesus’ intimate union with the Father will reach its apogee in His utter faithfulness to the cup of suffering. And so raising His eyes to the Father, Jesus welcomes this hour in that context of union with the Father. Jesus goes on in the prayer to describe the state of His disciples. He speaks of their unity with Him and their share in His mission. They have believed and in so doing share in Jesus’ intimate knowledge of the Father. After describing the disciples, Jesus prays for them. They must remain while He departs. Beyond these verses, He will ask the Father to grant them the same unity shared by Father and Son. He will speak of sending them as Jesus Himself has been sent. Jesus will also pray for those, like us, who will come to know His glory through the word of the disciples. This prayer of Jesus gathers key Johannine themes as it acknowledges the fragility of the disciples while speaking of the strength of the bond between them and Jesus. Jesus reveals the glory of the Father in His intense and self-giving love for them. Now they will have the opportunity to do likewise through the power of their union with Jesus. They will be Jesus’ glory in the world, especially in their love for one another. At the heart of Christian faith is belief in the person of Jesus Christ. For this reason, Mary and the Disciples could witness the Ascent of the Lord and then continue in prayerful relationship to Him in the upper room. For this reason, the early Christians understood summons of First Peter to see in Jesus their model for living and their consolation in suffering. For this reason, Jesus’ prayer in the Gospel of John speaks so powerfully of Jesus’ intimate relationship with His disciples and with us who also have come to see His glory through their word.